Imagine being dropped off from the tram and walking less-than one minute to the beach. You see the beautiful emerald–green water of the Gulf of Mexico and all the stress melts away. We have enjoyed that feeling at this home and you can too at the “Bermuda Cottage”. This wonderful 4b/4b cottage is new to the rental market and has been completely refurbished and decorated with your comfort in mind. The main floor includes a lovely appointed living room with large screen Hi-Def TV/DVD. There is a dining table with seating for six. A counter height bar and three bar stools adds additional seating. Beautiful heart of pine floors on the entire first floor. The large kitchen, with fully stocked cookware includes a side-by-side refrigerator, microwave, and dishwasher. For your convenience there is a Master bedroom with Queen bed and full bath with travertine floors. It has a tropical theme with armoire and large walk-in closet. French doors to the porch are perfect for morning coffee and reading. There is an outside shower with hot water and a convenient place to drop your beach and pool items. A side door entry brings you to the laundry room with full-size washer and dryer. Wireless, high-speed Internet connection is available at no extra cost. The second floor also has a Master queen bedroom and full bath. The French doors open to a giant covered porch overlooking the walking path. Another bedroom has two twin beds with a bathroom and a private balcony porch while the fourth bedroom has a queen bed and access to the covered porch as well. The third floor is a very cool loft with nine windows! One twin bed and a desk with storage. Enjoy the view! The driveway has room for two cars to park. Two beach chairs are available for your convenience. This neighborhood has the beautiful 12000 sq-ft pool lined with palm trees and has numerous waterfalls. Bike rentals are conveniently located in the neighborhood along with great restaurants, Seacrest Sundries, ATM and yogurt shoppe. Walk to Rosemary Beach (numerous restaurants, spa and shops), Walk to Alys Beach or bike to Seaside (great eats and shopping). 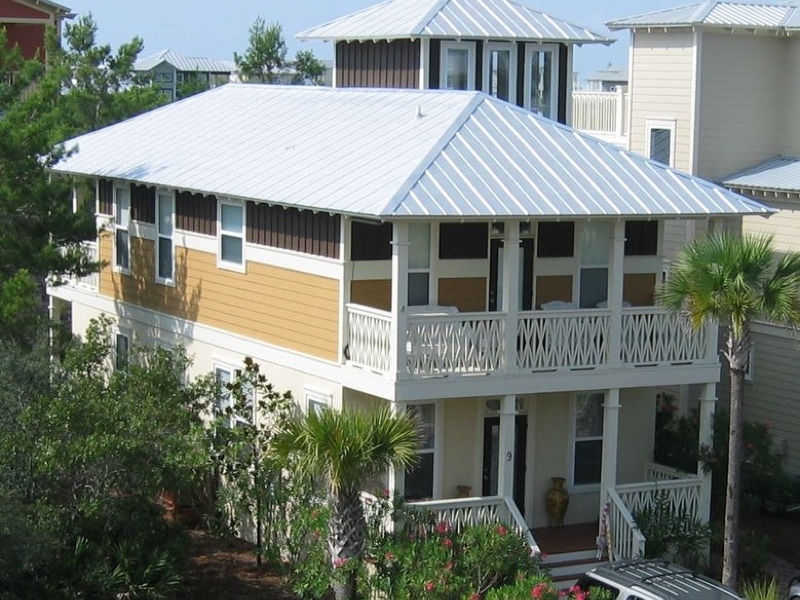 Near Camp Creek golf course, 18-mile bike path along 30-A, State Parks, fishing, hiking, Beach Bonfires, stand up paddle boarding, Grayton Beach, Panama City Beach, Destin and Silver Sands Outlet Mall. Wonderful restaurants throughout the 30-A area & Beautiful Sunsets. • A $50.00 non-refundable fee is required to secure your reservation at time of booking. This fee counts toward your total rental fee.